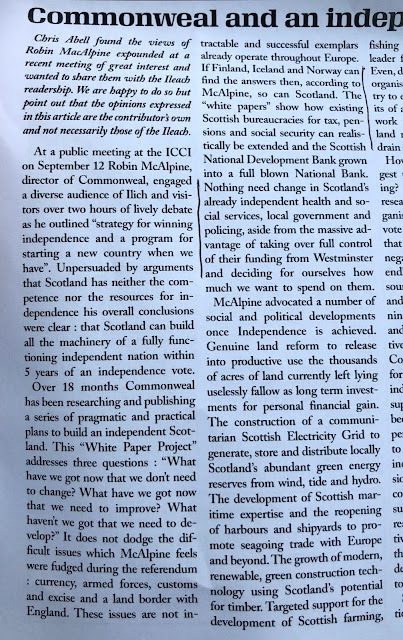 On a recent trip home to Islay I picked up a copy of the Ileach (the local paper) and read an article relaying the pro-independence arguments that had been put forward by the Commonweal's Robin MacAlpine at a recent meeting there. Being familiar with the Commonweal's "White Paper Project", I felt compelled to respond. 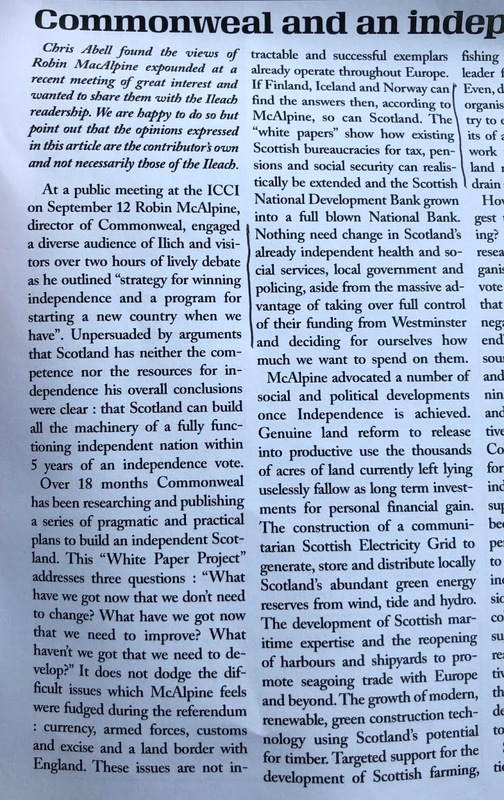 I read with interest Chris Abell’s article in last month’s Ileach describing the Commonweal’s “strategy for winning independence”, as outlined by Robin McAlpine at a recent meeting on Islay. Let me be clear about where I stand - there is after all no view from nowhere, there are merely different points of view. As Chairman of These Islands, a think tank which aims to encourage well-informed and civilised debate about the constitutional future of the UK, I have no party political allegiance but stand unabashedly for the view that more unites the nations of the United Kingdom than divides them (and I’m familiar with the Commonweal’s “White Paper Project”). We’re told Mr MacAlpine is “unpersuaded by arguments that Scotland has neither the competence nor the resources for independence”. Unfortunately he is arguing against a straw man of his own making here, because nobody suggests that Scotland can’t be independent, we merely respectfully disagree about what the implications of such a move might be. Claims that the Commonweal’s plans are “pragmatic and practical” and “do not dodge the difficult issues” deserve to be challenged. Scotland’s current deficit according to the Scottish Government’s own GERS figures is 7.9% of GDP. The Commonweal assume a Year One deficit for an independent Scotland of 5.5%, similar to the SNP’s own “Sustainable Growth Commission” assumption of 5.9%. These Islands has published a detailed paper (reviewed and endorsed by senior economists) which carefully explains why the assumptions used to reach these figures are not just heroically optimistic but in some cases fundamentally flawed. Even if we accept these figures, a small independent country starting life with a deficit of more than 5.0% while trying to create its own currency would face huge challenges. For context: the EU’s “excessive deficit” threshold is set at 3.0% and the European Fiscal Compact specifies a 0.5% limit. Contrast this with where we are today: the UK’s deficit is shared across our entire population, so the people of Scotland are currently only asked to bear their population share of a 1.9% deficit. So even to accept the Commonweal’s 5.5% figure is to accept that independence would make us materially poorer on day one. That difference of 3.6% of GDP is equivalent to over £6bn a year. If we take the current GERS 7.9% figure as being a more realistic starting point, the figure becomes just over £10 billion or c.£1,900 a year for every man, woman and child in Scotland. That is the effective net fiscal transfer in Scotland’s favour as a result of the Barnett Formula, it is the tangible benefit of UK-wide pooling and sharing. Pointing out the fact that an independent Scotland would lose that transfer is not to suggest that Scotland couldn’t be independent, it is merely to highlight the very real implications for our capacity to invest in public services. This simple fiscal arithmetic is why the SNP’s Growth Commission concluded that an independent Scotland would require at least a decade of further austerity. Nicola Sturgeon admitted as much in 2016 when challenged by Andrew Neil during a BBC interview: “we would deal with the deficit in the same way as the UK’s dealing with the deficit” she said. So when pressed the SNP tacitly accept that independence would mean an extended period of further austerity. Given the additional challenge of being a new small country creating our own currency, it’s pretty clear that this would need to be far deeper austerity than anything we’ve experienced in recent times. This context exposes the misleading nature of the Commonweal’s assertion that “nothing need change […] in health and social services, local government and policing”. A pragmatic and practical assessment that didn’t dodge the difficult issues would address the fact that significant cuts would be required to those public services which affect all of our day-to-day lives. The Commonweal’s paper simply fails to address this inconvenient truth. 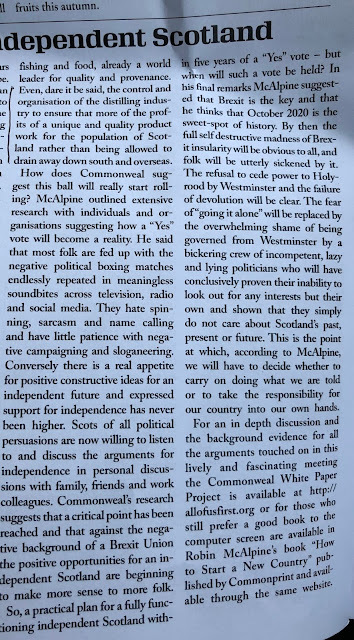 After quoting research showing people “hate spinning, sarcasm and name calling and have little patience for negative campaigning and sloganeering”, MacAlpine apparently went on to talk of “the overwhelming shame of being governed from Westminster by a bickering crew of incompetent, lazy and lying politicians” and “their inability to look out for any interests but their own”. 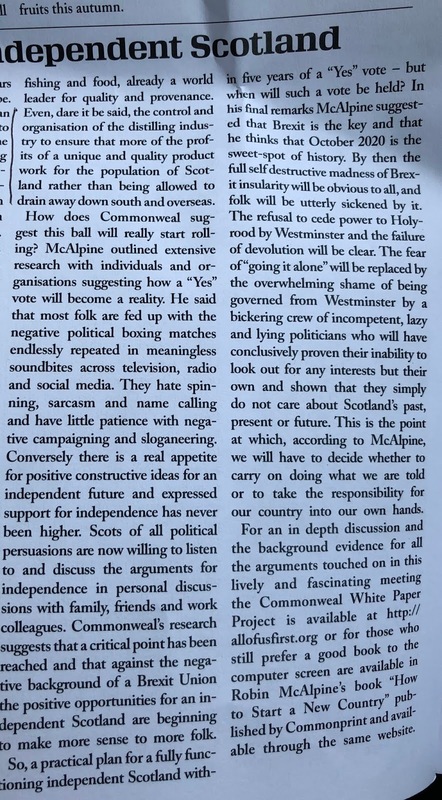 It’s a shame to read he resorted to such language, but it’s also unclear why he believes replacing politicians in Westminster (including 59 Scottish MPs) with more politicians in Holyrood would cure this problem – presumably it has something to do with our old friend Scottish exceptionalism? There’s also an assertion that Brexit means independence is “beginning to make more sense to folk”. In fact for many of us the challenges of Brexit merely illustrate how much more destructive and painful breaking up the UK would be. Scotland is far more integrated with the UK than the UK is with the EU. As well as having full fiscal pooling and sharing (i.e. we share the deficit) we share a currency, defence and international affairs costs and have deeply integrated machinery of state. However bad Brexit may be, breaking up the UK would be an order of magnitude worse; two wrongs don’t make a right. A final thought for those who suggest that Scotland receiving a fiscal transfer is evidence of economic failure under Westminster rule. The cause of Scotland’s higher deficit is mainly higher per capita spending rather than lower per capita revenue generation. Ileachs should understand this concept: just as Scotland is a relatively high “cost-to-serve” part of the UK, so Islay is of Scotland. Factor in the likes of Road Equivalent Tariff ferry subsidies, the costs of providing services to our remote communities and flights to the mainland for emergency medical procedures and I’m pretty sure Islay would have a higher per capita deficit than Scotland as a whole. The implied fiscal transfer that results is not evidence of an economic failing but of successful pooling and sharing, it demonstrates that we have a spirit of solidarity that goes beyond asking everybody to “pay their own way”. Scotland benefits economically from being in the UK and the Scottish Government now has tax raising and benefits powers which would allow them to redistribute wealth very differently from today if they had the political will. Maybe the Commonweal should focus on how these hard-fought-for powers could be used to create a fairer Scotland in the UK rather than campaigning for a poorer Scotland outside it. Wordcount discipline prevented me commenting on the hints about nationalising the Scottish whisky industry, the unfounded assertion that "support for independence has never been higher" or the fact that some of the ideas mentioned either are possible now with devolved powers or would fall foul of EU state-aid limits (the Commonweal is equivocal about future EU membership). This really is a major disappointment. I would have hoped for something better. First you unashamedly quote the current GERS budget deficit when the fact is that in the very first paragraph of GERS the authors make clear that their estimates are "about Scotland’s public sector finances under the current constitutional arrangements" - these last five words are crucial. This merely underscores the fact that much of the data is estimated because the UK govt does not collect the necessary data. At best, its a best guess. Nothing more. You really do need to stop these ex cathedra pronouncements about Scotland's deficit were we independent. Secondly, you might just have noticed that oil prices are on the way back up, which will, in due course - not necessarily next year, but in due course - influence the deficit (even the GERS one) positively. The issue is less what the deficit is now but what it might be in two or three years (or in 11 or 12 if the Tories stick to their guns). Next we get the EU card, But the Fiscal Compact applies only to members of the Eurozone and while we would have to commit this would only be when conditions allow and the Swedes have been playing that along for more than 20 years now. The "excessive deficit" standard has no teeth - if it did the UK would have been bitten long ago. When you write "figure becomes just over £10 billion or c.£1,900 a year for every man, woman and child in Scotland. That is the effective net fiscal transfer in Scotland’s favour as a result of the Barnett Formula, it is the tangible benefit of UK-wide pooling and sharing." you make it sound as though the UK is doing us all a favour, when the reality is that most of that is borrowed by the Treasury on our behalf, which in turn will charge us our population share of the interest. At the moment we are gaining, but this was not always the case - if we go back seven or eight years, the Scottish deficit was less than for the UK as a whole. At this stage you can of course point to pooling and sharing, which I agree is a benefit, but my own commitment to independence comes from a view that Scotland needs to be independent in order to prosper since UK govt policy is dominated by the economic needs of England which is far and away the largest part of the UK. With policies more appropriate to an economy that is more oriented to energy production and tourism than the finance dominated rUK, could we not do better? Would this make it worthwhile to give up pooling and sharing? Were you more aware of Commonweal's publications you would know that one of the foundations of their thinking is precisely how this could be done. You probably will reject their view, but to argue that "the Commonweal’s paper simply fails to address this inconvenient truth." reflects an inadequate knowledge of their work. Lastly you, and others of your opinion, make much of the fact that Scotland is much more highly integrated into the UK than the EU. Given that we have been one country for 311 years this is not really surprising, but just why would trade not continue? WM is clear they want to trade with everyone - just not Scotland? Why would well-established trading relationships, long term supply chains, simply fall apart because of independence? Are you really saying that UK companies with premises/ establishments in Scotland are going to close them down on independence? In conclusion, if you sold 64% of your dog food to a single client, would you not be worried strategically? The fact is the Scottish economy is in such a situation of dependence that when England catches a cold we get pneumonia. Some diversification is long overdue. As recently as yesterday the Prime Minister repeated there won't be a second referendum on Scottish independence. I appreciate the issue is a hobby, career or just to pass the time of day for many. But at some point Scottish Nationalists will have to come through the stages of grief, denial, anger, bargaining, depression and acceptance that the dream is over for good. And Scottish Unionists will have to confront the potential impact of Brexit on our economy, society and culture. 2014 may have be a high point for many but 2016 should have been when crushing reality kicked in, not another 2 years of naval gazing. If we're being honest, we've never been that good at being European in the first place so perhaps a parting of the ways is for the best. At least Tony Blair tried to an extent. British people are appallingly bad at mastering a second language, even at an elementary level and for many people supposedly working in tourism here. In terms of art, culture, fashion, and food we have always lagged behind our European neighbours ever since the Renaissance. Most of the top brands and manufacturers are based in Europe. Italian designers dominate the catwalks. German engineering is the envy of the world. French cuisine has global reach. On a public holiday in Spain for example the streets are often awash with festivities and parades and costumes. In the UK we either go to Wetherspoons or B & Q. When we entered the Commmon Market in 1973 the country was in deep decline after suffering the loss of Empire but after we began to feel the benefit of membership our economy and society improved remarkably in the 80s to the peak in the 90s, even helping to provide the framework to achieve a lasting peace in Northern Ireland. Time for a dose of reality everyone, the good times have passed. We'll look back on our EU membership as a settled, stable and prosperous period in our history. Soccer Doc. Are you really a doctor? As Kevin points out in his reply and in his many other posts that you should read you do not seem to have any understanding of the issues. Why go for anonymity anyway? Why the inevitable swipe at the "dog food". If you are a doctor then I suggest that you should only mention it when commenting on medical issues. 2. You speak as if that 10 billion is a freebie when in fact its part of the UK deficit which we will make our own contribution to. Yes public spending can be shown to be higher pc than elsewhere in the Uk, if you ignore spending not allocated to any particular region and projects of "national importance". 3. No you misunderstand. I am well aware that - on the basis of GERS - we spend more than we bring in in tax (though that is influenced isn't it by the number of estimates of what is raised in Scotland in tax - something that would be clearer under independence with our own version of HMRC though one that actually collected via a non byzantine tax system) That was not my point, My point was that with higher skill, better paid jobs - eg less dependence on call centres - then revenue would increase with little cause to increase spending. I am sure you could go on - you only have a limited range of points to make which all tend to start from our "precious Union". Perhaps your own thinking would be enhanced by not beginning from how it can be defended at all costs. And btw I realise that there is more to oil tax revenue than price - but if price is down as it was a couple of years ago, then oil tax revenue will not be much. 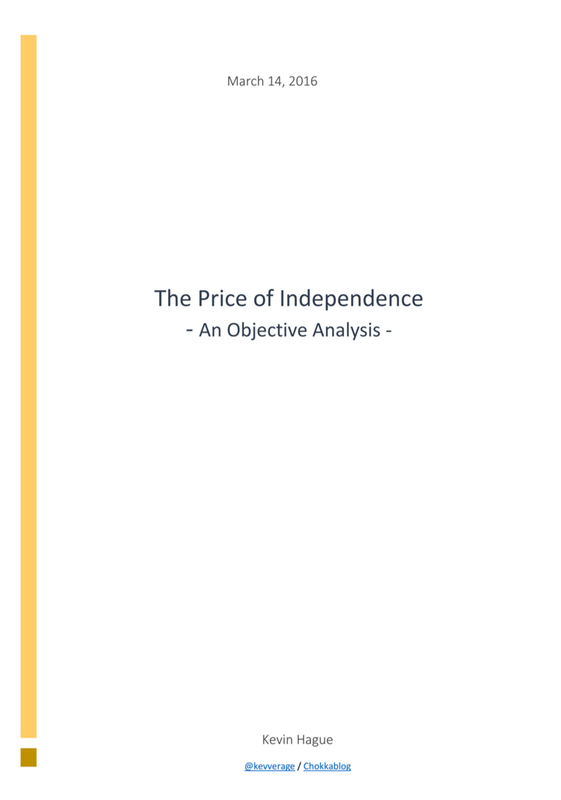 In short a high price is a necessary condition though not sufficient - perhaps we need to manag our oil in the manner of the Norwegians rather than WM which has been happy to see it out the ground so that it can spend the proceeds. 'Lastly you, and others of your opinion, make much of the fact that Scotland is much more highly integrated into the UK than the EU. Given that we have been one country for 311 years this is not really surprising, but just why would trade not continue? WM is clear they want to trade with everyone - just not Scotland? Why would well-established trading relationships, long term supply chains, simply fall apart because of independence? Are you really saying that UK companies with premises/ establishments in Scotland are going to close them down on independence? I mean honest to goodness, can you genuinely not see how ridiculous you are being or are you just trolling me? Herein lies something of a paradox in Scottish Unionism. UK-wide pooling and sharing is less about solidarity and more about self-interest and the self-preservation of Scottish Unionism. Which is only natural human nature after all, I'm not judging anyone. Barnett is based on geography and not need. Even during the boom years of peak oil in the 1970s and 1980s when Scotland was generating a surplus revenue for the Treasury, we still enjoyed a higher than UK average share of public expenditure at the expense of the poorer regions of England & Wales. Scottish Unionists have long known this and are seemingly no more concerned about the poorer regions getting less money or support in the rest of the UK than Scottish Nationalists. Despite all the fine soundbites about solidarity, you rarely hear Scottish Unionists calling for a fairer funding formula for the UK because scrapping Barnett would reduce Scottish public spending and undermine one of their key arguments against independence. Defenders of Barnett try and argue Scotland is somehow a special case because of the geography of remote rural and island communities. But do remote areas actually cost more overall to service than urban communities and on what evidence? Urban areas tend to have a far greater share of public expenditure in terms of infrasture investment on roads, rail, telecommunications and construction. Urban areas also in general have higher levels of crime, therefore a greater share of the spending on policing, courts and prison population. The main public transport links are all subject to anti-terror protection and intelligence gathering on anti-terrorism and international organised crime is focused largely on urban areas. Urban areas have more fast food outlets within reach of most of the population and less open space to spend leisure time in, so rates of obesity could be higher, impacting on health services. So I'm not totally sold on the idea that urban areas are proven to be more expensive in terms of overall public services and spending, unless there is clear evidence this is the case. I agree with most of what you have said, but I take issue with your inference that our economy prospered as a consequence of joining the EEC. Those of us who were there can remember an ongoing economic catastrophe throughout the 1970's which resulted in Mr Callaghan going cap in hand to the IMF for a bailout. Conditions relating to pay increase caps imposed by the IMF were challenged by the unions again and again, resulting in the failure of the government and 1979 general election which brought Mrs Thatcher to power. The reforms instigated by her governments, not least the steady reductions in personal taxation, are what returned Britain to prosperity. Meantime the rest of the EEC was (and largely still is) governed by Socialist governments whose policies would have prolonged Britains decline. If you are a student of Thatcher you'll know she supported the accession of the UK to the European Communities in 1973 and campaigned for a yes vote in the British referendum on membership in 1975, precisely because the Common Market as it was then, was central to her economic reforms for the UK. She was also an enthusiastic supporter of a Europe-wide single market and signed us up to the Single European Act in 1986 which created the single market and eliminated barriers to trade. While she was always an outspoken critic of the ever closer political union in the EU and the moves towards the Euro, personally I don't think she would have been comfortable with us leaving the European Economic Area after Brexit.